I have not always been a cookie person. I tend to find them dry and overly sweet. If there is another option on a dessert table for something else, I will almost always choose that. HOWEVER- I have solved this problem. I may have cracked the cookie code. Something about the bitterness of the dark chocolate and the tartness of the salt makes these cookies irresistible. I made them using my large two tablespoon ice cream scoop, and 70% dark chocolate. These cookies are the perfect compliment to any holiday table, or even just a Friday night at home. Try them out, and discover cookie bliss. Using a stand or hand mixer, beat softened vegan margarine and brown sugar together until “fluffy” (aka incorporated well). Add in vanilla and maple syrup, and mix until all your wet ingredients together. In another medium sized bowl, whisk together dry ingredients. Turn on your stand mixer and slowly pour the dry ingredients into the wet and beat on medium speed until combined. Add in the chopped chocolate, and mix on low until evenly distributed through the dough. Using a large two TBSP icecream scooper, scoop out large balls of dough and place on parchment lined cookie sheet. Sprinkle sea salt flakes on top of the dough balls and place cookie sheet into the refrigerator to chill for at least 30 minutes. Preheat the oven to 350F while the cookies are chilling. After 30 minutes of chilling, bake cookies for 13-15 minutes or until golden brown. Let cookies rest on the baking sheet for 2-3 minutes after baking, and then transfer to a cooling rack. I highly suggest eating them while they are still warm with a cold glass of almond milk. Seriously - Do it. The recipe makes about a dozen cookies, to be eaten in one day…..or many days, but let me know how THAT goes. It’s been awhile. I stepped back, I worked on other things in my life, and now I’M BACK! I couldn’t stay away for too long. And I’m coming back strong with a RECIPE REVAMP! This may come as a shock, but I do not like tofu. As a vegan I feel like it’s sacrilege to say something like that, but it’s true. Something about it makes me nuts. In the last version of my Classic Coffee Cake, I used silken tofu as a solution for not using sour cream. I couldn’t taste it in the final coffee cake at all, but my brain still knew it was there. I also wanted to offer an option that was soy free as well. So I reworked my Grandmas Classic Coffee Cake one more time and created the most DELISH soy free, vegan, coffee cake. Perfect for a special occasion, or a just because brunch. Combine flour, brown sugar, cane sugar and cinnamon in a bowl. Add in melted coconut oil and stir together until it forms a crumbly topping. Split streusel in half into two separate bowls. Mix together all the dry ingredients into a large stand mixer bowl. In a smaller bowl, combine the oil, non dairy milk, vanilla extract and apple cider vinegar. Slowly add in coconut cream, and stir combine your wet ingredients. Make sure to use coconut cream that has NOT solidified, and is still a “liquid”. Start your stand mixer on low, and gradually pour your wet ingredients into the dry bowl until incorporated. *Do not over mix. Once combined, pour HALF of your batter into a lightly greased 8x8 baking dish. Top with HALF of the streusel, and spread streusel out until you have a nice even layer. Pour the second half of your batter into the baking dish, and top with another even layer of remaining streusel. Bake for 45-50 minutes, or until a toothpick comes out with a few soft crumbs. Let cool, and enjoy with a warm cup of coffee! This recipe is very special to me. It's based off of a coffee cake recipe from my grandma, who passed away a few years ago. It's still hard for me to think about her not being around. I can so clearly hear her laugh in my head, and envision her taking bites of all the food in the kitchen while she cooked. She made the BEST chocolate chip cookies in the world, and I'm sure some of my love of baking came from her. I always felt so loved by her, and I hope this coffee cake recipe sends a little bit of love your way this Christmas. It was even better the morning after I made it, so you could easily make this the night before and cover it until the morning. It's not an overly sweet cake, but more of a bread/cake sweetness. I've added an option to make it sweeter if you like, so check that out as well! Preheat oven to 350F, and grease an 8"x8" pan. Start by making your streusel topping. Combine flour, brown sugar, cane sugar and cinnamon in a bowl. Add in melted margarine and stir together until it forms a crumbly topping. Now make your cake batter! Cream together butter and sugar. Add vanilla, nondairy milk, apple cider vinegar and mix together. Alternate adding blended silken tofu and dry ingredients into the other wet ingredients until just combined. Pour batter into greased pan and top with streusel. *optional sweetness. Add an icing drizzle on top! Combine powdered sugar, a splash of vanilla extract, and a splash of milk until you reach a 'drizzle' consistency. Drizzle over cooled cake for a sweetness kick. It finally snowed here in NYC, which means that the holiday season is officially upon us! For me, Christmas time means hot apple cider, Christmas movies, and sugar cookie decorating! The thought of trying to veganize a sugar cookie recipe is very nerve wracking...So I didn't do it. No, I'm not saying I used eggs or butter- but I did borrow someone else's recipe and just used egg replacer and Earth Balance. If you've never used egg replacer, I'm about to change your vegan baking life. It's a combination of starches that acts as the 'binder' in vegan baked goods. It comes in a package that looks like its from the 1970's, and is usually pretty easy to find in the grocery store. I don't use it a lot, but in this sugar cookie situation...it's perfect. After quite a bit of trial and error, I'm going to share some tips and tricks with you that have saved me many cookie headaches! keep is simple. No need to try and create a multicolor masterpiece. Pick one or two colors of frosting and top it with sprinkles! If you do want to do a design on your cookies, pick simple shaped cutters that won't require intricate piping work! Stars, Stockings, Trees, and Candy Canes are all fairly simple designs that require one or two colors with minimal intensive piping. Chill your rolled out dough in the refrigerator for at least 30 minutes before cutting out your shapes and putting them into the oven. Working with warm cookie dough will result in spread out cookies. The butter inside will be too warm right after it's rolled out and will melt/expand your shapes. Cookies must be COMPLETELY cooled before you try to decorate them. Otherwise the icing will melt into the cookie. If you want to create fancy piped designs.....get piping bags or plastic bottles with tips. It's just easier. Ziploc bags will work just fine, but piping bags will truly up your game. Make Mini Cookie Bites! (Pictured in this post) Cut out little squares and frost them different colors! Often times people don't want a full cookie, so these little bites are a perfect sweet treat. Use royal icing instead of a buttercream frosting. I suggest this because royal icing will keep its shape after drying for about 12 hours - buttercream will always stay soft and smear any design you try to make if you stack, layer, or do anything with your cookies. 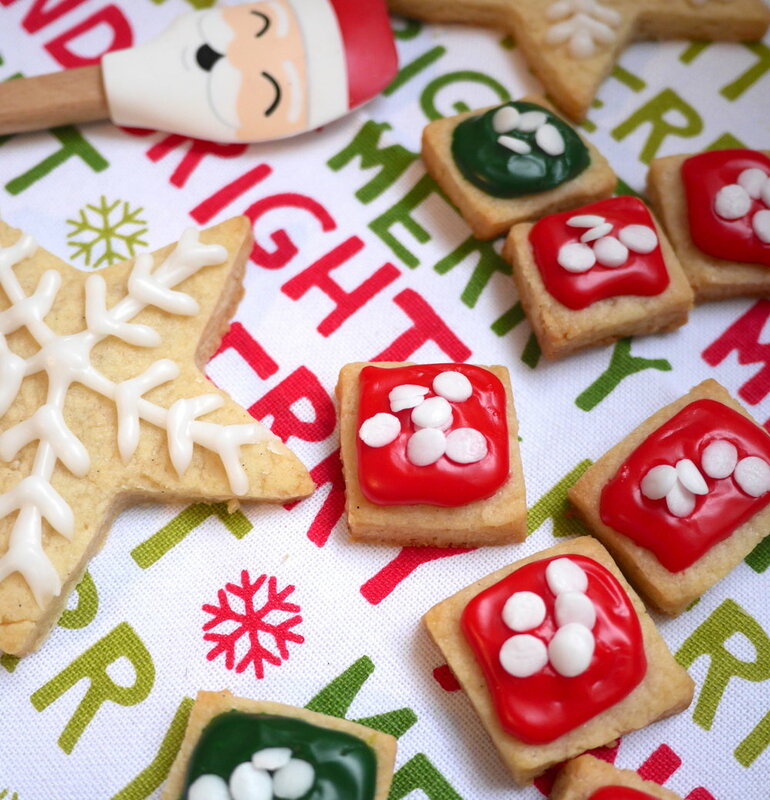 Classic Holiday sugar cookies require royal icing. Royal icing is extremely simple to make! It's two ingredients! Powdered sugar and water. That's it! Pour powdered sugar into a bowl, and then add water to it 1 tsp at a time while whisking. You want it at a consistency that it will stick to the fork and spoon when lifted from the bowl, but when it falls back in, holds its shape for a second or two before blending into the other frosting. This way it won't slowly roll off the cookie before it dries, or be too firm to spread at all. Let your frosting DRY. I cannot stress this enough. Royal icing takes at least 12 hours, if not more, to firm up. So don't think you'll be creating multi colored/leveled cookies in one evening. Intricate sugar cookies can take days to make. If you want shiny royal icing, you can always add a little bit of corn syrup. I know corn syrup is the devil, but I'm just letting you know how to get that gorgeous shiny frosting that you're probably envisioning in your mind. I hope these tips help you in any cookie conundrum you may find yourself in! If there are any other questions I didn't answer, leave a comment below and I'll get back to you asap. I'd say that it's pretty common knowledge that the best part of thanksgiving is getting to eat all the leftovers. I love eating leftovers the next day for lunch, but I realized that we skip a whole meal before we get to enjoy Thankgiving Take Two. Breakfast! This led me to create these amazingly delish cranberry poptarts. You save your leftover pie dough from making my Easiest Pumpkin Pie Ever, fill it with leftover cranberry sauce, and top it with some orange cinnamon glaze. The only thing you really have to make is the glaze! You could also make these the day before without the glaze, heat them up the next morning, and then drizzle some of the glaze on top. No reason to wait until lunch for Thanksgiving leftovers! In a pot on medium high heat, combine all of your ingredients. Keep on medium high heat until your mixture starts to boil, and then reduce to a low simmer. Simmer for about 15-18 minutes, stirring occasionally. Once sauce has started to thicken, remove from heat and let cool. Spread about 1.5 TBSP of cranberry sauce onto the middle of half the rectangles. Place the remaining rectangles of dough on top and crimp the edges with a fork. Using the fork, poke a few air holes on top. Place on your baking sheet and bake for 15-17 minutes, or until the edges barely begin to brown. Let cool. Once the Poptarts have cooled, you can top with the orange cinnamon glaze and enjoy! Blend the can of pumpkin puree, silken tofu and cornstarch together until your mixture is a consistent color and texture. Bake for 45 - 50 minutes. About halfway through, add a crust ring to keep the crust from browning too quickly. There should be a small wobble left in the pie when you remove it. It will set once it sits for a few hours. Let it cool/chill in the refrigerator for at least 4 hours or overnight. Keep all ingredients and tools in the refrigerator until you are using them! In a food processor, pulse together the flour, salt and sugar. Add in your small cubes of butter and pulse until the butter has just started to incorporate into the flour. The flour should feel/look like little pieces of sand. You don’t want any large chunks of butter, but you also don’t want the butter to start to melt into the flour. If your butter has started to melt, you can pause at this point and place your mixture in the refrigerator to chill again. Once your mixture is chilled, or continuing from pulsing in your butter, slowly pulse in your VERY COLD water one TBSP at a time. You should stop pulsing right before the dough starts to form a ball. Most recipes will say to stop when it becomes a ball because that’s a good indicator of moisture, but that actually means the dough is a little too wet. At this point you should take the dough out of the food processor and split it in half, shape it into disks, wrap it tightly in cling wrap and refrigerate for at least an hour. Once it’s refrigerated, you can take it out and use as needed! This cake would be the perfect addition to any Halloween table! I'd like to start by saying I'm sorry for the grainy pictures- I only had my old camera available when I was shooting this cake...but you still get the idea! The "ombre" technique is NOT a hard one, and once you get the hang of it it's so fun to play with other colors! Start by filling four different piping bags (or Ziploc bags!) with the different colors for the candy corn and jack o lantern face. You’ll probably need a bit more white because you’re also going to cover the top of the cake with the white part of the frosting. Cut one corner, or the tip off, of the three candy corn frosting bags. I start with my bottom color so that it doesn’t droop down and bleed into the other colors. In this case that would be the yellow! Grab your yellow frosting and pipe around the bottom on the cake. I had two rows of piping for each color on my 6” cake. Next, do the same with your orange and white. Once you have your rows piped onto the cake, you can either use a ***bench scraper, (Which I will link my favorite below) the flat side of a knife, or an icing spatula to smooth out the colors. You do this by placing the long flat edge of your tool against the side of the cake and dragging towards yourself. This is easier if you have a way to turn the cake as you drag your tool, but you can always drag scraper as much as you can, pull it away, clean it, and then start again on the next “side” of the cake. At this point, your cake should somewhat resemble the picture above. Using the same tool you used on the sides of the cake, you’ll want to flatten out the ridges on the top of your cake. (You can see them here in this picture) Drag your tool across the top of the cake from the far side towards yourself. Once this base layer is created, I always like to chill my cake for an hour or so before I pipe anything onto the sides or top. I’m not going to lie, it’s a lot easier to pipe the jack o lantern face onto the cake if you have a piping tip inside your bag, but it’s doable without! Just cut a really small bit off of the end of your bag and do a test line on a piece of parchment or something else to make sure the size of the hole is right. Once you have the right size hole or piping tip in your bag, you can start to follow the face outline you created with your toothpick! When you’re happy with your Jack O Lantern, place it back in the fridge to firm up - you don’t want a droopy face! Chill for another hour or so - The design can definitely be done the night before and kept in the fridge in a cake carrier or other airtight container. Take your happy Lantern out of the fridge before your party and place it on your Halloween table for a sweet treat as well as an adorable decoration!! Place flour, sugar and other dry ingredients in the bowl of a stand mixer and whisk together until combined. In a separate bowl, add all wet ingredients together, and mix. When wet ingredients are combined, add them into the dry ingredient bowl slowly with the mixer on low. Mix until there are no more prominent lumps in your batter. Divide batter between three cake pans evenly. Bake for 17-22 mins or until a toothpick comes out clean from the cakes. Run a knife along the edge to ensure they aren't sticking to the pan and let them cool completely. Once cool, flip out of the tins and frost with whatever flavor you choose! Start by whisking, with a stand or hand mixer, your butter and shortening until it is smooth with no lumps. It might even start to melt a little, that's okay! Add in your vanilla paste and mix again to incorporate. Then a little at a time, add in your sifted powdered sugar until you reach the taste/consistency that you want! I find it works best if I fold in the sprinkles with a spatula by hand after my vanilla frosting is finished, and not to try and use the stand mixer. Should keep in an airtight container in the refrigerator for up to 2 weeks. *You can substitute more vegan margarine if you don't have/want to use this! Banana bread is one of my all time favorites! This recipe combines bananas, pumpkin, and maple almond butter to create an amazingly delicious fall flavored version. Using a hand mixer, cream together your butter and brown sugar in a large bowl. Once combined, add in other wet ingredients. While continuing to mix, slowly incorporate your dry ingredients into the wet bowl. Divide the batter in half. Add the first half into the loaf pan. On top of the batter in the loaf pan, drop dollops of the maple almond butter to create a good layer. Use a knife to swirl the almond butter into the batter. Pour the other half of the batter on top of the layer of almond butter. Bake for 50 mins - 1 hour. Cool completely before removing from the pan. Divide batter among cupcake liners and place into the oven for 18-22 minutes or until a toothpick comes out of the cupcakes clean. Start by whisking, with a stand or hand mixer, your butter and shortening until it is smooth with no lumps. It might even start to melt a little, that's okay! Mix in your vanilla paste, maple extract and apple cider vinegar. Then a little at a time, add in your sifted powdered sugar until you reach the taste/consistency that you want!